Airline KLM has introduced a new feature in its app that uses augmented reality to help passengers assess wether their hand baggage is of the correct size. The functionality, which uses Apple’s AR technology, is aimed at speeding up check-in and reducing customer confusion over luggage allowances. The AR hand baggage check uses a transparent, virtual KLM suitcase of the maximum possible dimensions. The AR technology makes it possible for the virtual image to be placed in reality and interacted with, enabling passengers to compare their own suitcases and other hand baggage and make changes ahead of travelling if necessary. 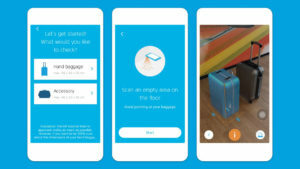 The new service, which is available in the KLM App for iOS, is the latest in a series of AR initiatives by the Dutch firm. Previous uses include a 360-degree display of the Dreamliner aircraft within the KLM App, and the KLM Houses App, which uses AR to tell the story of aviation pioneer Anthony Fokker and his House 98 aircraft.